Metal Church’s one reads like most. Massive buzz to start with, popular couple of albums, everyone leaves to go to “other projects” in the 90s, and then they reform in the noughties. You can usually add in the return of a “classic” vocalist too, and later releases should always include phrases like “return to our roots” in interviews. That pretty much brings you up to speed with MC. But what makes the five piece a little more impressive than most is that whilst they might have been at the forefront of the West Coast scene that spawned the aforementioned Metallica way back when, they don’t offer a watered-down version of their vision now. So whilst “Damned If You Do” might not be vicious thrash – and let’s face it, there’s very little of that these days anyway – it is nonetheless delivered with vicious intent. Right from the off, the guitars slash like razors, and new drummer Rick Van Zandt gives his kit a pounding, but it is singer Mike Howe that carries the song. His style has always had more of a power grandiosity than a thrash sneer, but it seems even more so here. It wouldn’t, really, be a huge stretch to imagine this as an Iced Earth song. Indeed, there is something more of an epic feel than usual here. “The Black Things” takes its time to get into overdrive and has a cracker of a solo all before Howe has uttered a word and there is an undercurrent of violence about this. “Revolution Underway” is more hook filled, and acts basically, as a rule book for those who want to do modern metal in a classic way, “Guillotine” blusters in with a real fury, and “Rot Away” is probably the closest to the 80s sound, and provides proof that these boys could still engender a moshipit at the drop of a hat. “Into The Fold” crushes, it really does, a slam and a chug of which most bands would be envious – and at the risk of mentioning Howe too much, the vocals are really astonishing here. “Monkey Finger” comes as something of a surprise in truth. More like something off Skid Row’s “Slave To The Grind” record than anything else, it rumbles along superbly. “Out Of Balance” is back with its horns up and ready for the scrap, while the last one “The War Electric” provides a close that is very much in keeping with what has gone on before, as well as having some proper soaring harmonies about it. 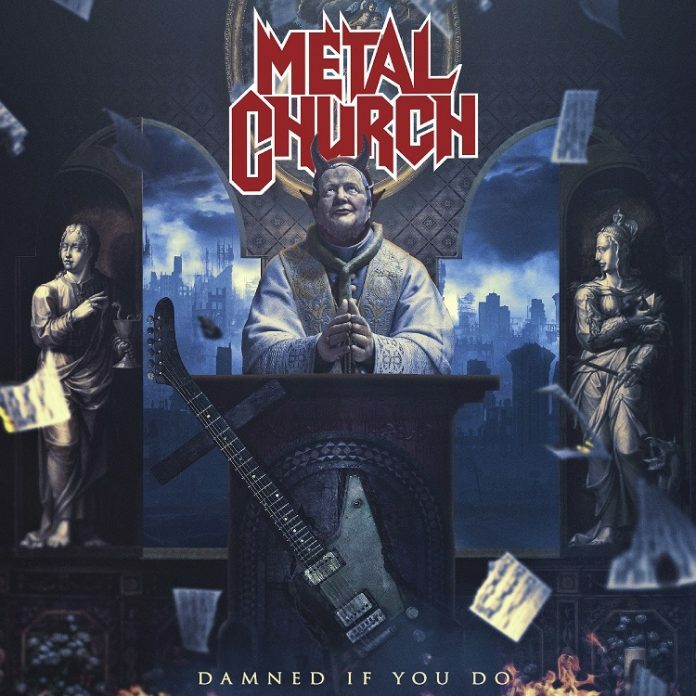 “Damned If You Do” answers a number of questions that you always ask about bands that have been going as long as Metal Church. Chiefly, are they still relevant and can they write songs that add to their legacy? The answer is yes on both counts. And this is still a Church of mighty fine noise.